One of the biggest challenge of our time is to see through appearances, because they can often be misleading. Marketing asks designers to create very enticing and beautiful packagings to suggest that the tea is of very high quality. This often reminds me of those YouTube videos with extreme makeup transformations! What you see at the end is miles away from reality. So far, the best teas I had came in very common bags, while leaves in great looking packages were almost always disappointing. 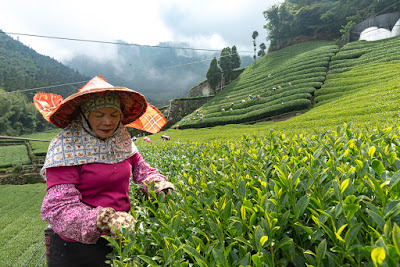 Thus, in the tea world, consumers must remain very rational and sensible when approaching a new tea. This also applies to professional buyers who travel to the production sites. 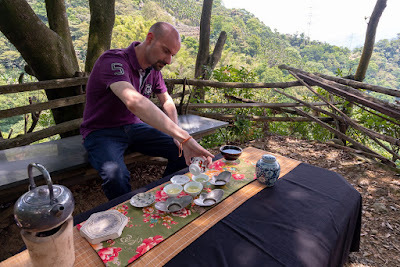 It's easy to get emotional and carried away by the surroundings, the expert tea master who brews the tea... One of the best way to stay unbiased is to brew the tea in a standardized fashion to evaluate it (and compare it to others). In Taiwan's Dong Ding competition, the standard is 3 grams for 6 minutes in a porcelain tasting set. 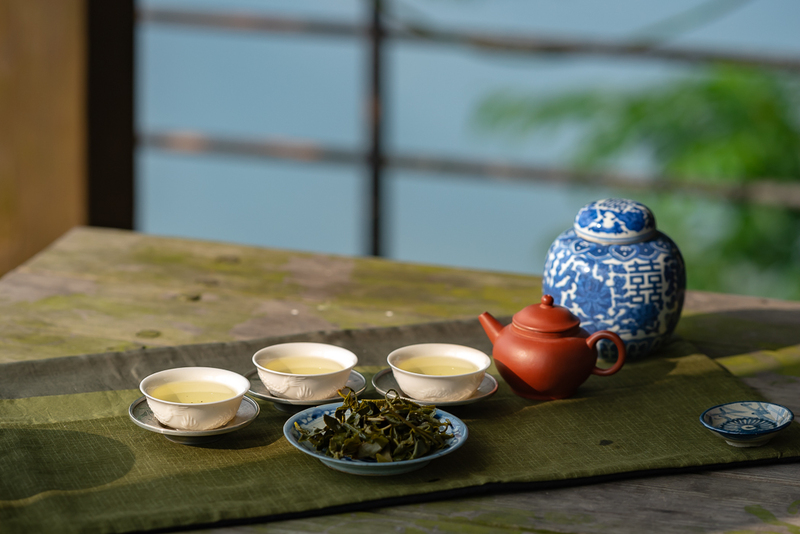 Glazed porcelain doesn't impact the taste of tea and the long brew makes sure that all defects in the leaves come out in the brew. 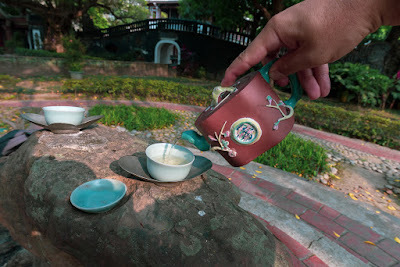 If the tea tastes OK like this, it can only taste better when brewed with skill and care. 2. 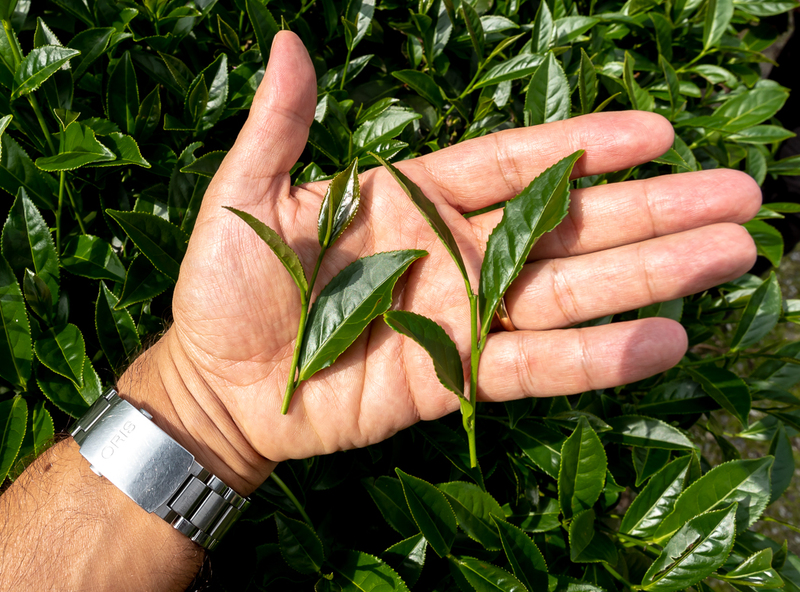 The sight of the 6 minutes brew of these leaves without filtering. 3. The sight of the open leaves, after the brew. 4. This year, I've also started to make pictures of 1 or 2 open leaves only to better see their details. Once the rough diamond is found, it's the brewer's task to prepare it to perfection! This step 2 comes after the selection, after the commercial transaction. This is what I am doing in this Chaxi, using a silver teapot to extract a maximum of aromas from these golden buds. 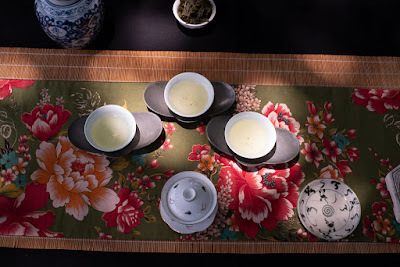 And I'm using thin white ivory porcelain cups to emphasize the finesse and lightness of the taste. This is magnifying the beauty and the character of this red tea. The aesthetics of these pictures are not simply an appearance. 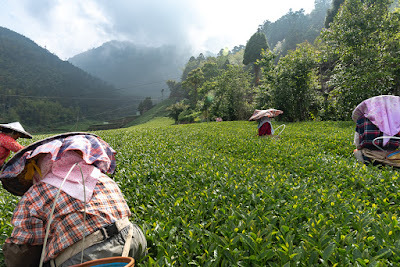 They reflect the truth and beauty of this tea. 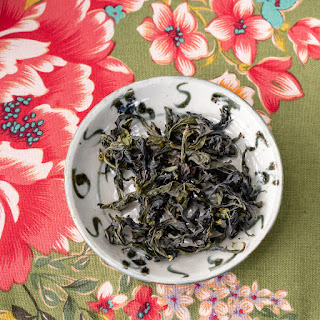 The key to brew it well is to understand that buds are baby leaves: they are very concentrated with flavors and so small that these flavors are quickly extracted. That's why it's best to use few, especially with a silver teapot, and brew rather quickly. To sum up, even the most elegant packaging will end up in the trash. Disregard it. True tea beauty comes from within the leaves. 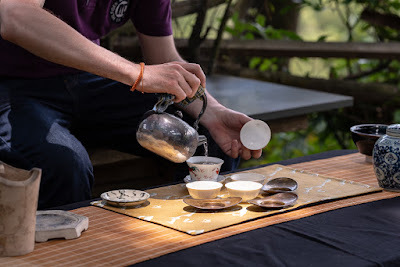 A few days ago, I had tea at the Lin Gardens with a tea enthusiast who has purchased 6 aged '7542' puerh cakes from the late 1980s for roughly 70,000 USD! 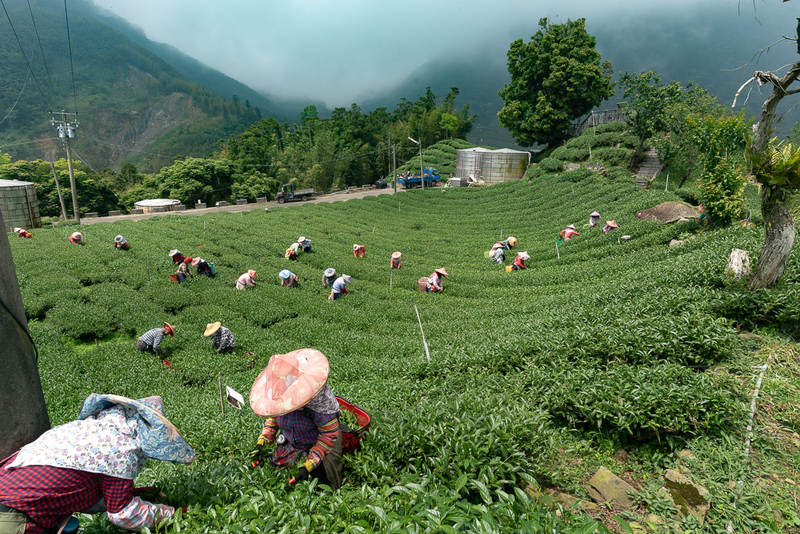 This high price reflects a new reality in the tea market: exclusive teas are getting more and more expensive. Affluent Chinese buyers bid up the prices of tea as they seek the same prestige and complex flavors of top quality wine. If you've been following the wine market a little, you'll know that a bottle of top wine are reaching astronomical heights. The most expensive wines comes from Burgundy with its tiny estates: a bottle of Domaine Romanée Conti (6000 bottles per year) will easily take you back more than 10,000 USD. In 2001, I purchased 6 bottles of Chateau Margaux 1999, a premier grand cru classé from Bordeaux, at 120 USD per bottle and now each costs 600 USD! In the US, the current bottle, from 2014, of Opus One from Napa valley is priced at 385 USD... (Both wineries produce roughly 150,000 bottles per year of those wines). 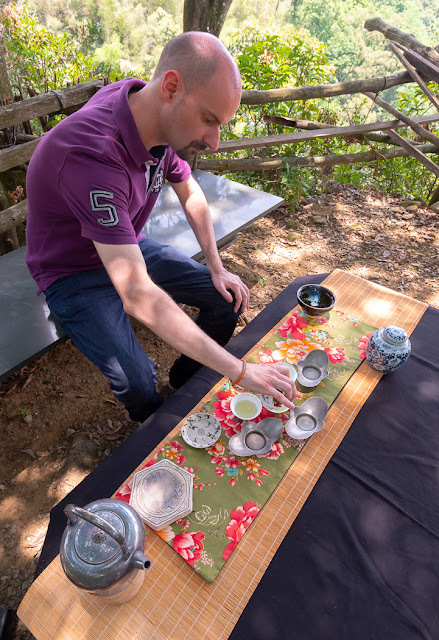 Tasting famous wines has become a very expensive luxury, while famous teas are still extremely affordable, especially if you follow my tips! 1. 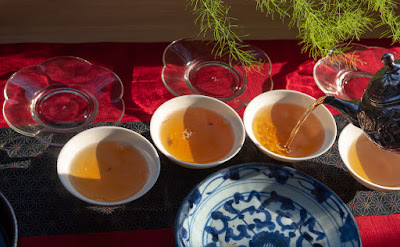 Great teas are like great wine: they are scarce, taste fantastic and are not meant to be drunk on a daily basis! 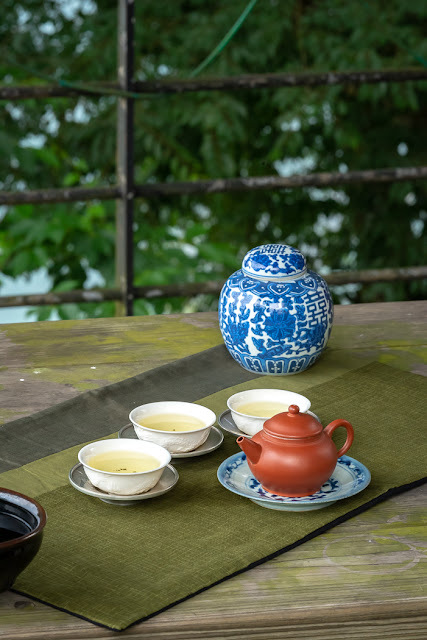 The most famous tea in China is the Da Hong Pao, a yan cha from Fujian province, comes from just 4 tea bushes on a rocky cliff in the Wuyi mountains! 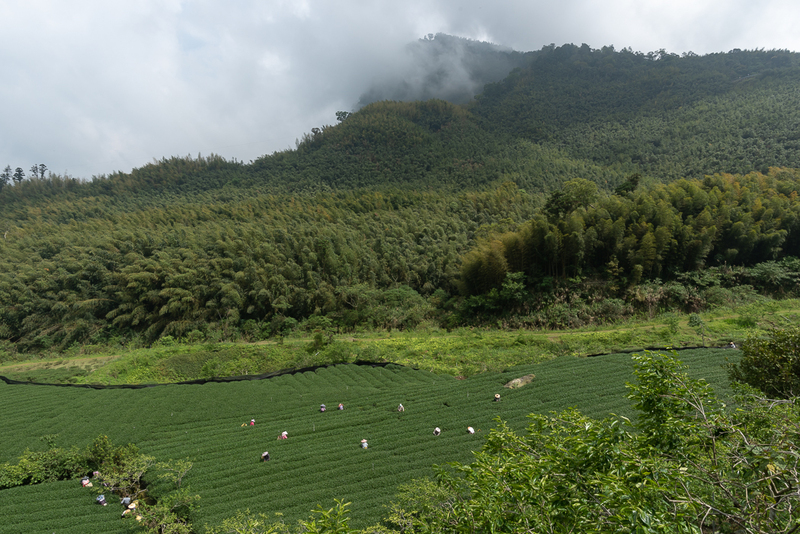 The Longjing plantation that was supplying emperor Qianlong (1711-1799) with green tea was slightly bigger with 18 trees! 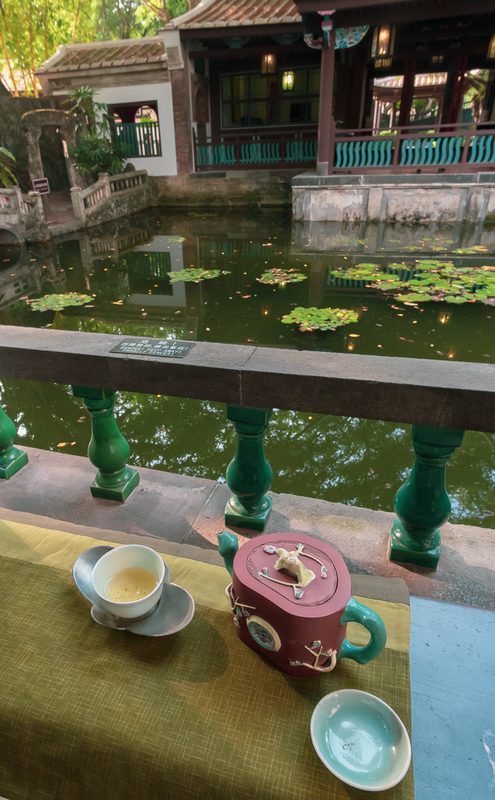 These 2 examples show that the scarcity of famous teas is actually even more acute than wine. 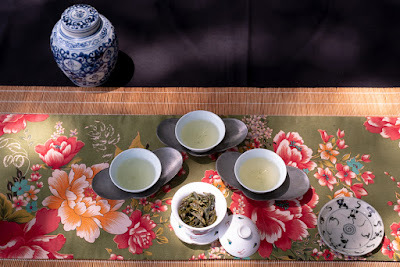 Therefore, don't expect that you'll be able to purchase famous and exceptional teas on the cheap. 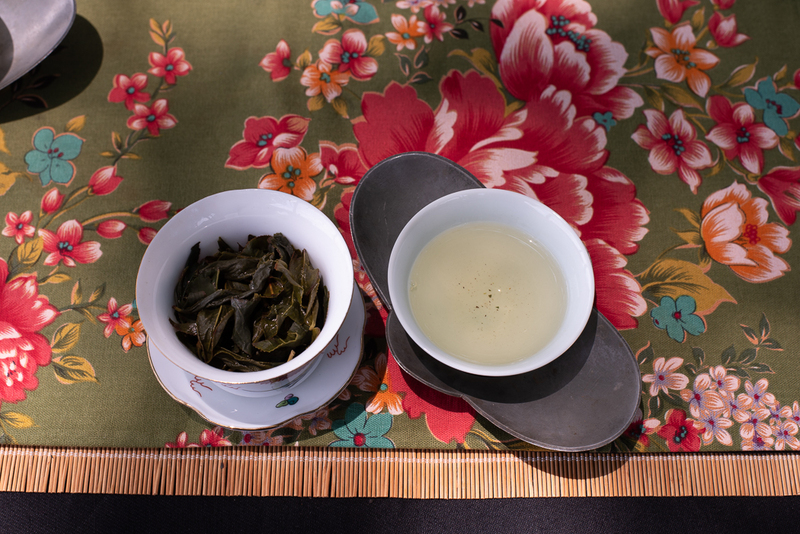 In Taiwan, the best lot from the Dong Ding Oolong competition sells for 5000 USD for 300 grams (12 kg total production). 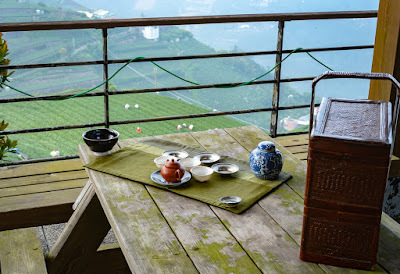 And the high mountain Oolong from FuShou shan, also dubbed the president's tea, retails at 155 USD for 150 gr on my online boutique. This plantation is one of the highest in Taiwan at 2500 meters elevation and is the unofficial supplier of the presidential palace in Taipei. 2. 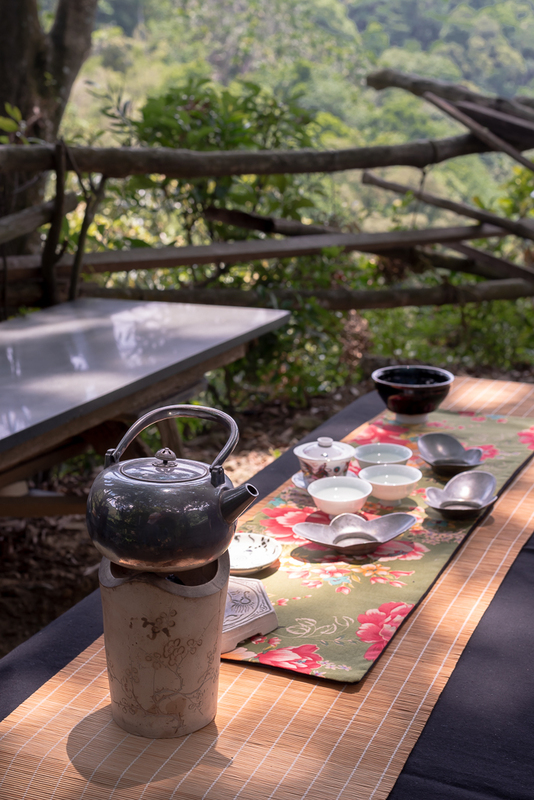 Group tastings are a good way to reduce the cost of expensive tea. The wine world also uses this tool to let many drinkers share the cost of their education. We live in a world where ideas and general knowledge tends to become free thanks to the Internet. 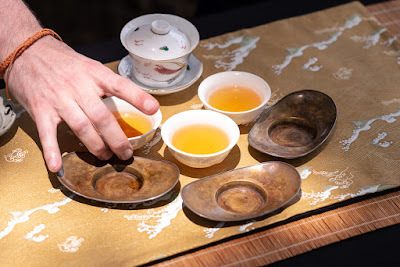 However, when it comes to wine or tea tasting, no words, pictures or videos can substitute for the actual tasting experience. The goal of this tea education is simple and essential: learning how great tea tastes helps you identify which teas are exceptionally delicious and which are not. It boils down to the same characteristics as great wines: an elegant and long lasting aftertaste. Great wines and teas have a presence that stays with you for several minutes. 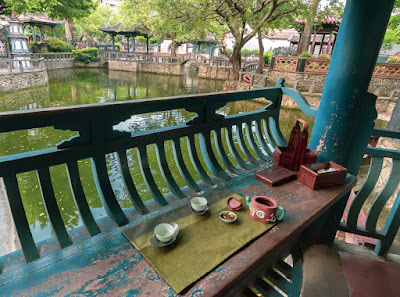 A few sips from a wine glass or from a tea cup are enough to make this experience. 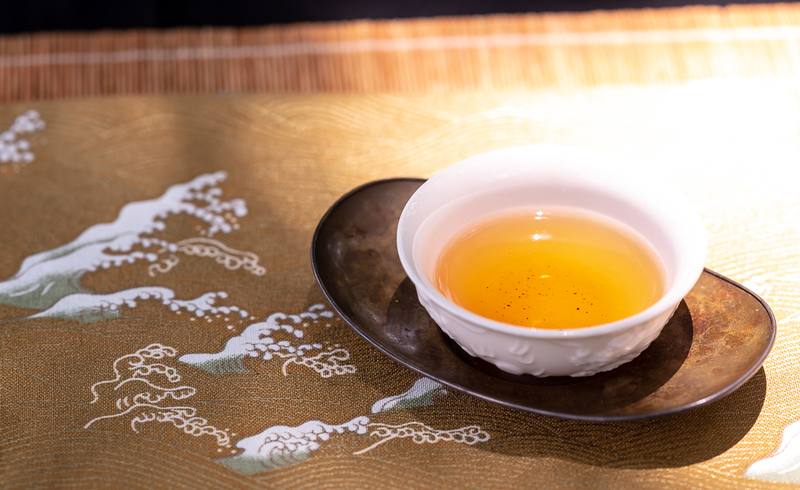 You don't need to drink the whole bottle or 8 brews of tea to experience the drink's quality. Actually, the law of diminishing marginal utility suggests that there's most pleasure in the first cup. 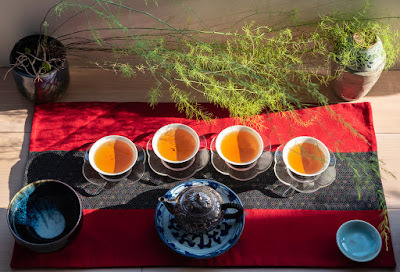 Sharing great teas in a group is therefore an excellent strategy to lower their cost. 3. 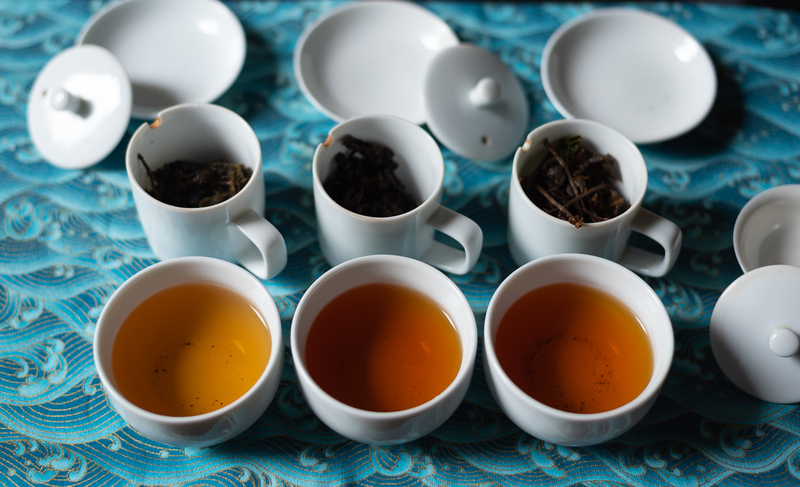 Purchase and brew top teas in tiny quantities. 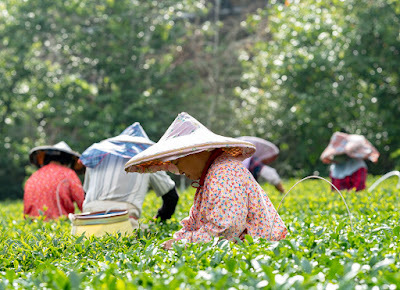 This is where tea is different from wine, which is constrained by the format of the 750 ml bottle (or the half bottle). 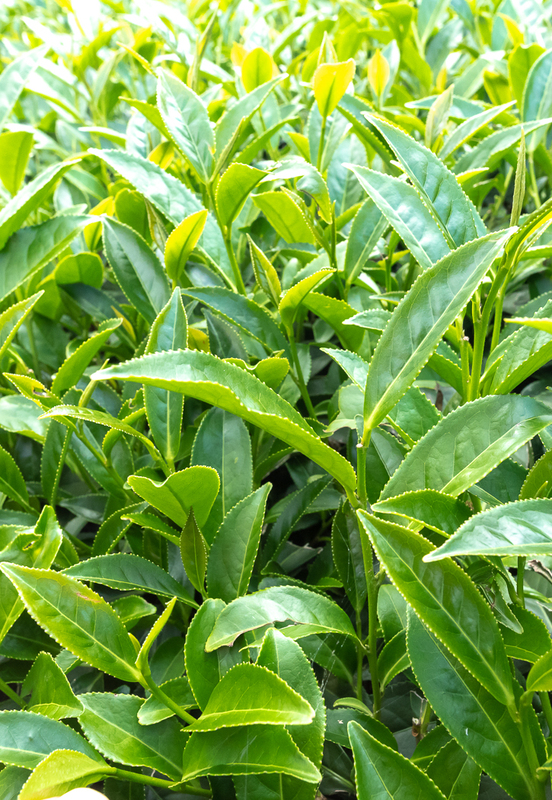 Loose tea can be sold and packaged in very small quantities, sometimes even down to the gram! This makes a lot of sense with top teas, because they are produced in very small amounts. Instead of selling it all to one very rich person, it's more satisfying to let a great number of people enjoy the tea, especially if they are going to share it in a group! 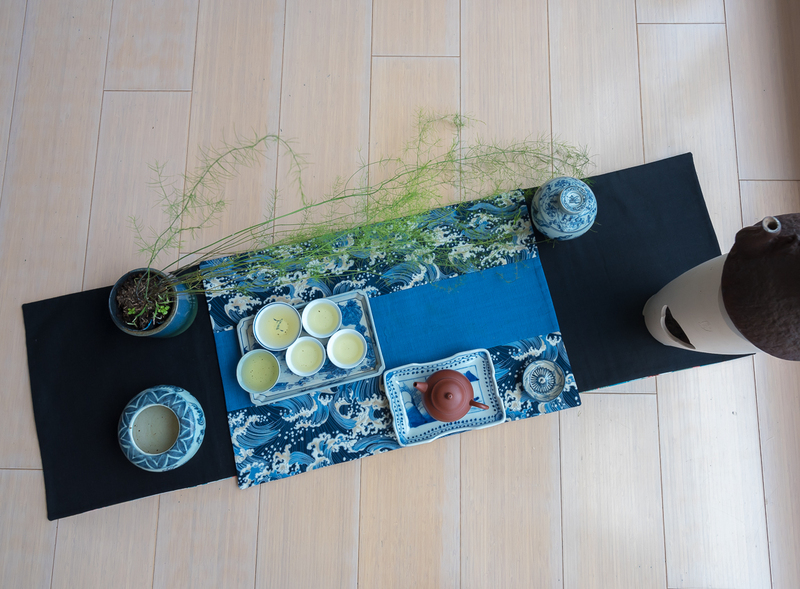 This trend to smaller quantities is obvious in the puerh world. Pressed cakes are getting smaller and lighter as prices of leaves of old trees have skyrocketed in recent years. 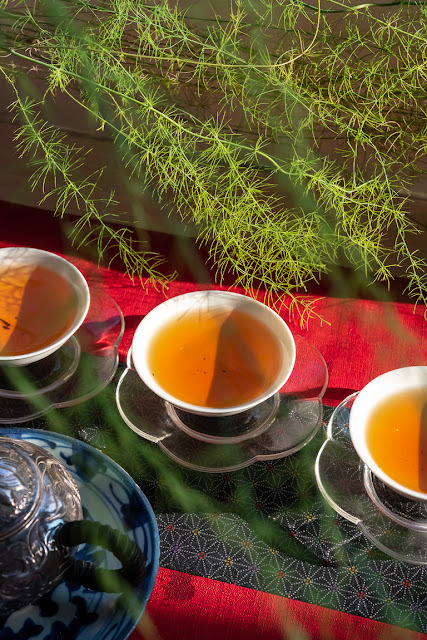 Except for lowering the price of your purchase, there are another 3 reasons why it makes sense to brew top teas with fewer leaves. First, it's because this how you can best judge a tea. The standard brew at the Dong Ding Oolong competition, the biggest tea competition in the world, is 3 grams brewed for 6 minutes in a 120 ml porcelain standard cup. 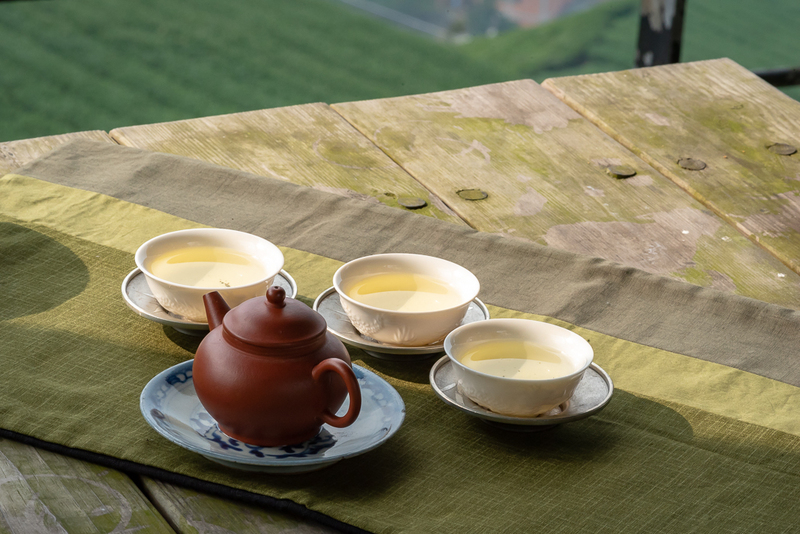 While average teas will not taste good under such conditions, the best Dong Ding Oolongs will still taste delicious, because the long brewing time emphasizes their amazing aftertaste. This doesn't mean that top teas should be brewed in this standardized manner. -Ideally, the brewing should be adapted to the character of each tea.- However, top teas shine most when pushed to their limits. The second reason for brewing top teas with fewer leaves than other teas is because the longer brews will compensate for the fact that you're using fewer leaves. Otherwise, with the same amount of leaves and longer brews you'd get a too strong concentration of flavors in your cup. 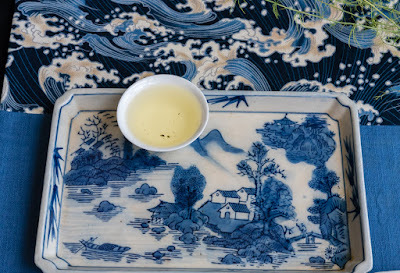 Third, the most amazing tea miracle happens when you feel a lot of pleasure from a brew that seems light at first, but contains a lot of things that slowly unfold. 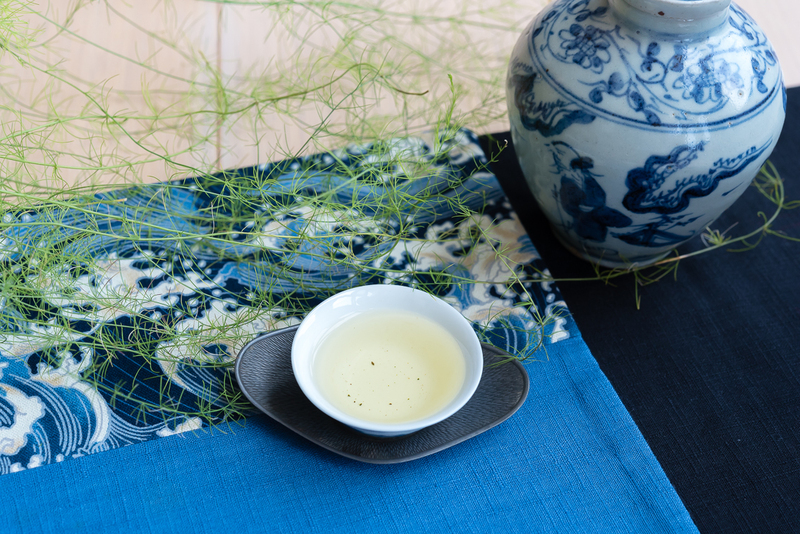 Teaparker calls it the Wu Cha feeling, when the tea feels so pure that it doesn't feel like tea at first. Only an exceptional tea will taste satisfying and rich when brewed lightly. What is considered light will vary from one type of tea to another, of course. Loose green teas are meant to be brewed lighter than Oolongs. During that afternoon at the Lin Gardens, I used only a handful of leaves from this spring 2017 old arbor sheng puerh (2 or 3 grams) in a rather big Yixing teapot. 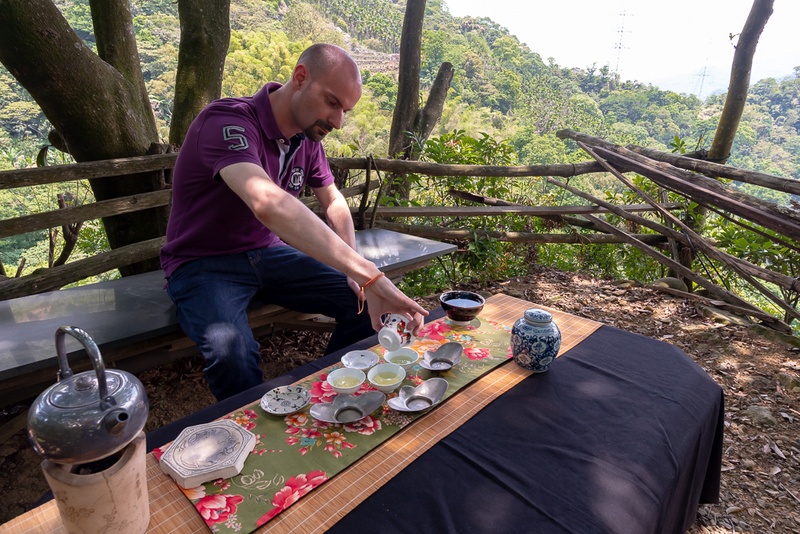 My visitor was amazed by the fantastic taste and energy of the three long brews we made! 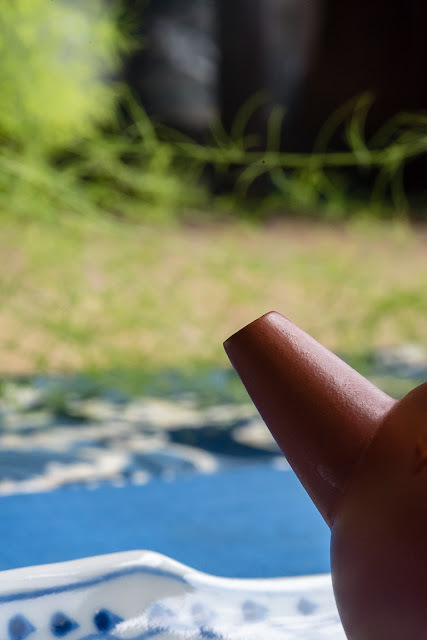 The open leaves barely covered the bottom of the teapot. 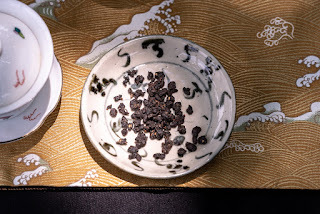 Conclusion: The world of fine teas is getting more expensive and quality or pleasure isn't always guaranteed by a high price. This is another good reason to purchase expensive teas in small quantities. Baozhongs nouveaux et lecteur ancien sont là! Environ 6 mois après le lancement de mon blog, en 2005, j'ai installé un compteur de visiteurs sur mon site. Vous n'êtiez alors que 10 à 20 à venir me lire chaque jour. 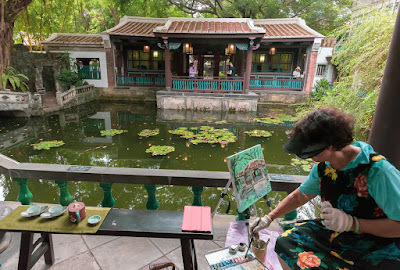 C'était l'époque où chacun se connaissait dans le monde du gongfucha en ligne! Parmi les tous premiers à me contacter il y a Emmanuel! 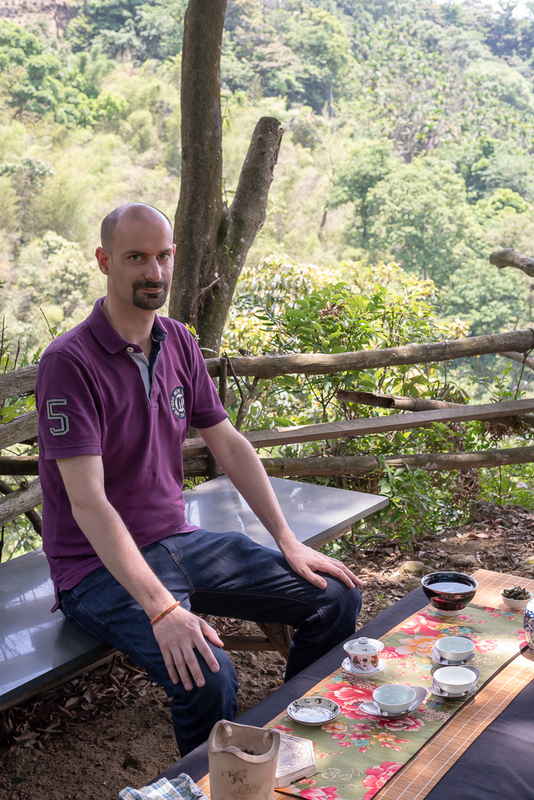 Et, 12 ans plus tard, nous avons enfin l'occasion de déguster du thé ensemble à Taiwan, l'ile aux trésors qu'il visite pour la première fois! Aussi, je mets les bouchées doubles pour l'accueillir dans les meilleures conditions dans un de mes lieux favori, les montagne de Wenshan. Cela tombe bien, car les nouveaux Baozhongs de ma sélection sont enfin disponibles! 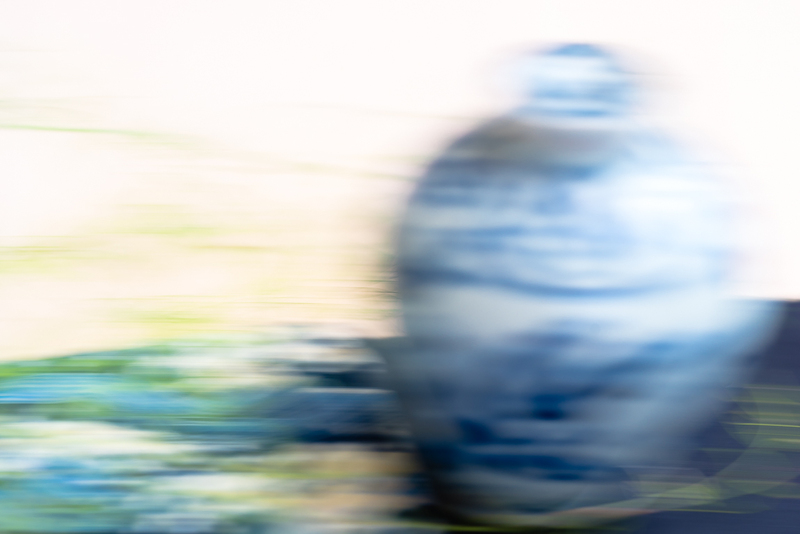 Emmanuel est donc le premier à pouvoir déguster mon Baozhong 'forêt subtropicale' de ce printemps en exclusivité mondiale! C'est un thé qu'Emmanuel connait bien, car je le propose pratiquement depuis le début de mon activité commerciale. Dans les coupes en céladon, il conserve une coloration jaune clair qui indique un niveau d'oxydation plus traditionnel que les Baozhongs ultra verts modernes. Emmanuel m'avait demandé de boire un thé en accord avec notre lieu de préparation. C'est pourquoi aussi j'ai choisi du Baozhong issu de ce même massif forestier. 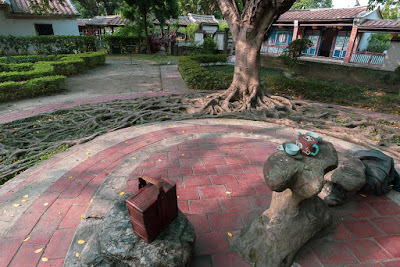 Et comme Emmanuel est végétarien et très sensible aux arômes artificiels, j'ai aussi eu envie de lui faire goûter ce Baozhong semi-sauvage issu d'une plantation de thé abandonnée. Il a remarqué que les odeurs de ce Baozhong sont plus intenses. J'ai aussi permis à Emmanuel de s'exercer à la préparation du Baozhong. Le fait qu'on s'alterne lui a permis de prendre conscience des différences entre ses infusions et les miennes. Ainsi, j'ai pu le guider pour améliorer sa technique. 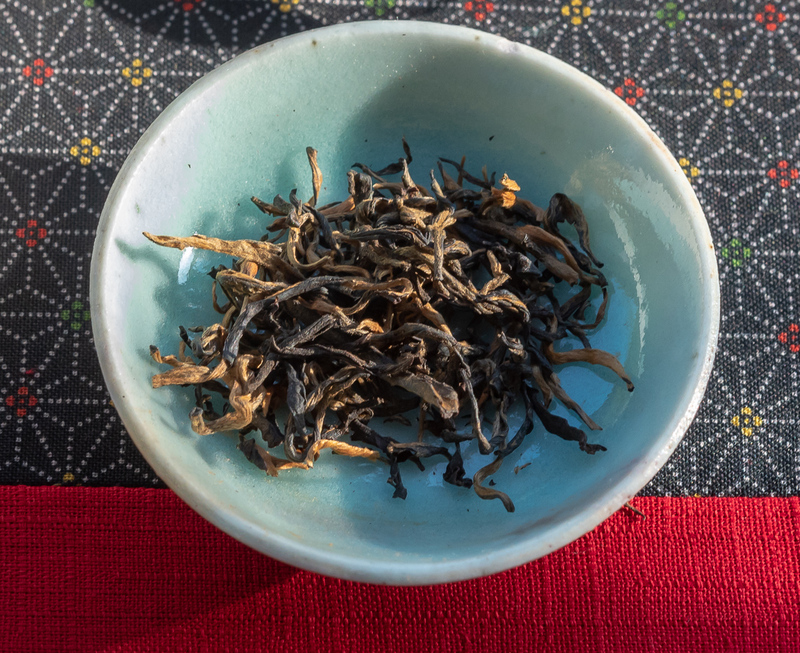 L'important est d'arriver à bien ouvrir les feuilles pour qu'elles occupent bien toute la place dans le gaiwan (ou la théière). 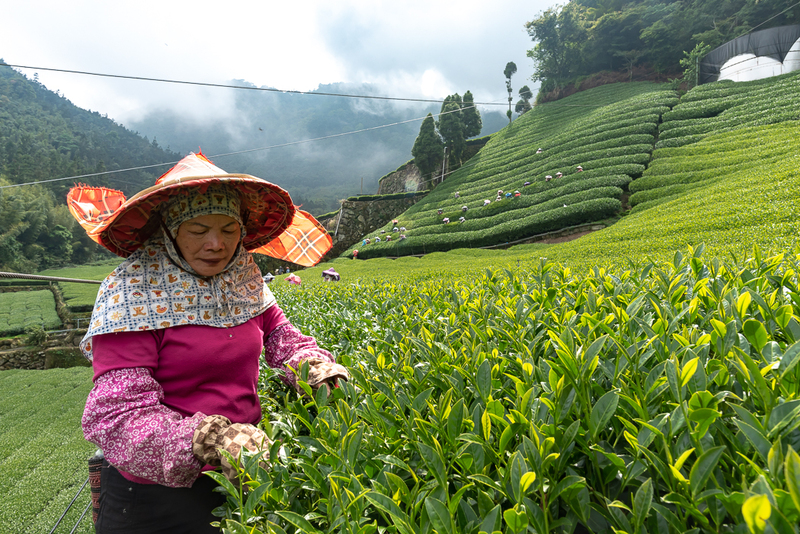 La transparence du premier Baozhong n'avait rien à envier à ce deuxième!La qualité et la concentration des arômes sont bien au rendez-vous dans ce cru du printemps 2018. La sensation de bien-être est intense, même si le Baozhong n'est habituellement pas son thé de prédilection, me dit Emmanuel. Dans 'Comtesse de Charny' Dumas qualifie l'odorat du "plus subtil et plus aristocratique de nos sens"! Nous n'avons pas encore envie de retrouver le commun des mortels. Nous n'allons donc pas en rester là. Notre Chaxi "Baozhongs dans la nature en fleur" se termine et laisse place à un nouveau Chaxi: "voguons sur la mer des infusions en or"! 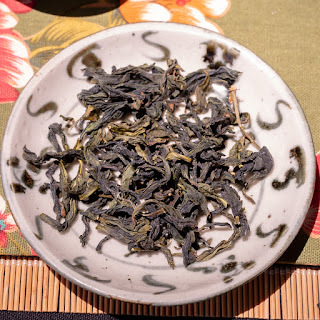 Après quelques infusion de mon Hung Shui Oolong de Dong Ding en théière Duanni d'Yixing, nous passons à un thé nouveau, le Hung Shui Oolong à haute oxydation et haute torréfaction par infra rouge de Shen Mu de l'hiver 2017. 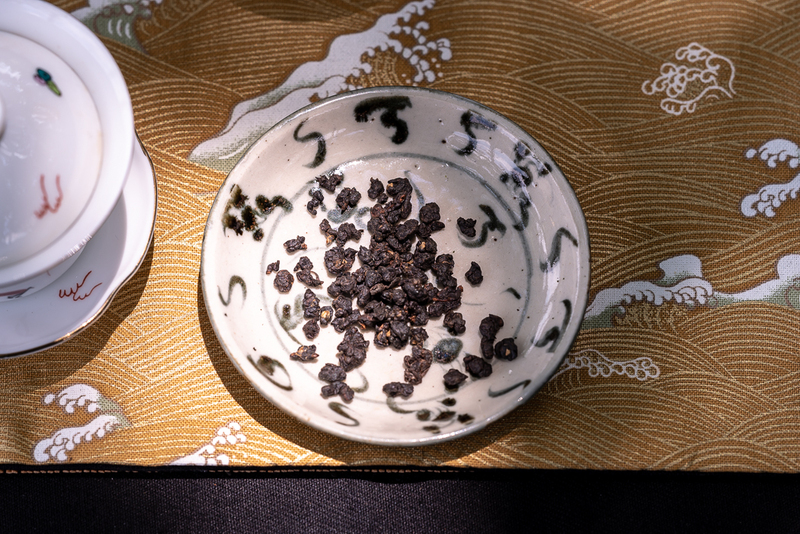 Ses odeurs de torréfaction sont si bien maitrisées que nous l'infusons en gaiwan en porcelaine! 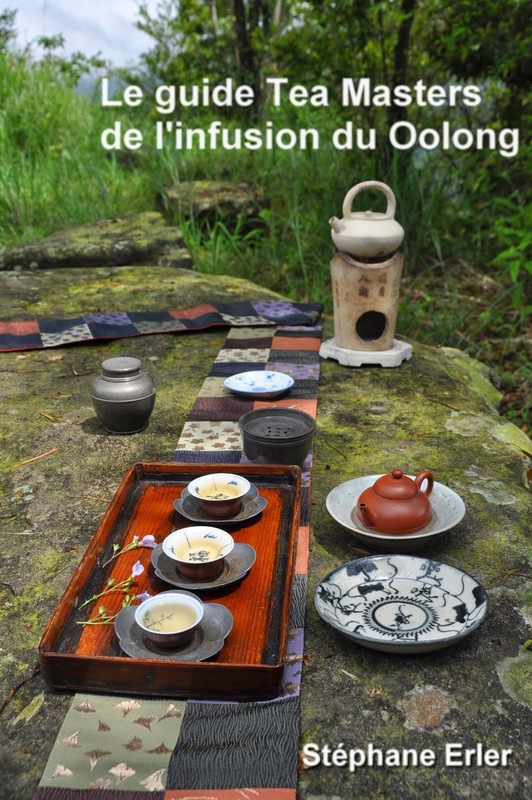 Le silence des gestes lors de l'infusion en dit plus long que tout un discours sur la concentration et la passion du thé. Les oiseaux sifflent et chantent au-dessus de nous. Les infusions plus douces et subtiles les unes que les autres nous permettent de ressentir leur libre insouciance. The weather at end of April was partly cloudy and partly sunny. You can notice this in the pictures I took for this article. The conditions were therefore not ideal, but there were days or half days that were better than others. 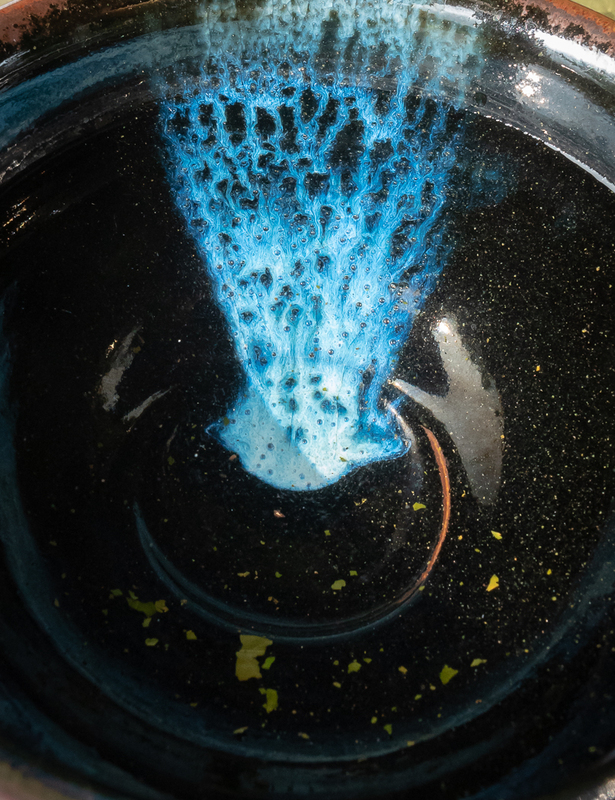 It's this kind of varying circumstances that make each batch of tea taste very different. There was no shortage of manpower in Alishan this year. 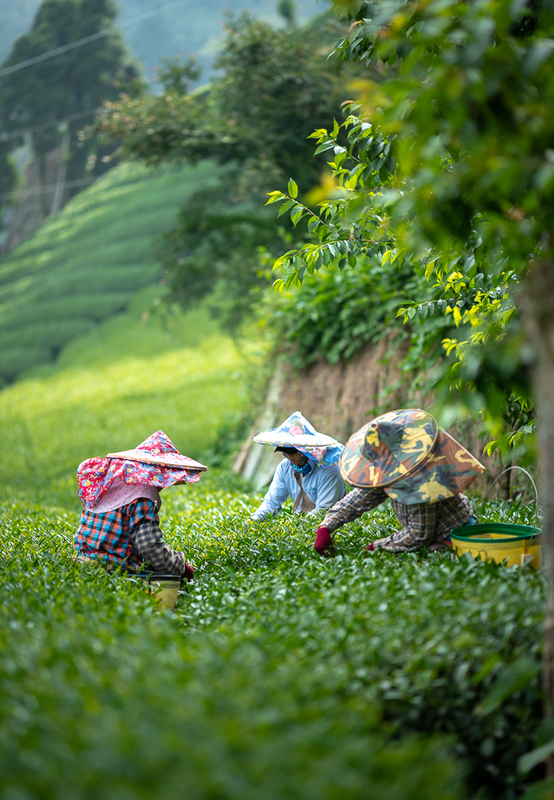 Big groups of workers help harvest the leaves faster, when the weather is suitable. This helps produce a more consistent flavor than when the leaves are harvested slowly. The young ladies are mostly from Vietnam or Indonesia and seemed pretty happy with their work. There were also some older ladies from Taiwan lending a hand. The harvest on my farmer's plantation didn't go very smoothly that day. It didn't have much to do with the workers or the weather on that day. Can you spot the problem in the picture below? I didn't see it right away. The farmer showed me that some stems were missing their bud! Can you see it above? If not, look at the two leaves on my hand. The one on the left is normal, but the one on the right is missing the bud! This problem was caused by a 10 minutes episode of hail at the end of March! The small ice drops have damaged the plantation by destroying the most fragile part, the buds. There's no hail in Taipei or at low altitude in Taiwan. 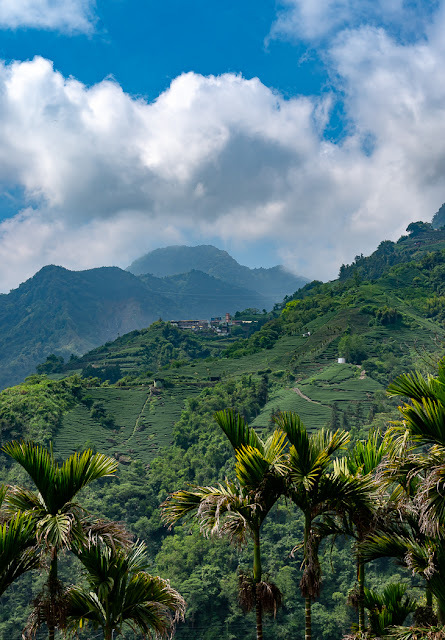 However, in the mountains, this kind of extreme weather event is more likely and will reduce the quality of the tea that is produced. On the other hand, when it's very cold and snows in winter, the defense mechanism of the tea trees actually help strengthen the next leaves that the tree will produce in spring! This is another reason that makes good high mountain Oolong taste both light and thick! 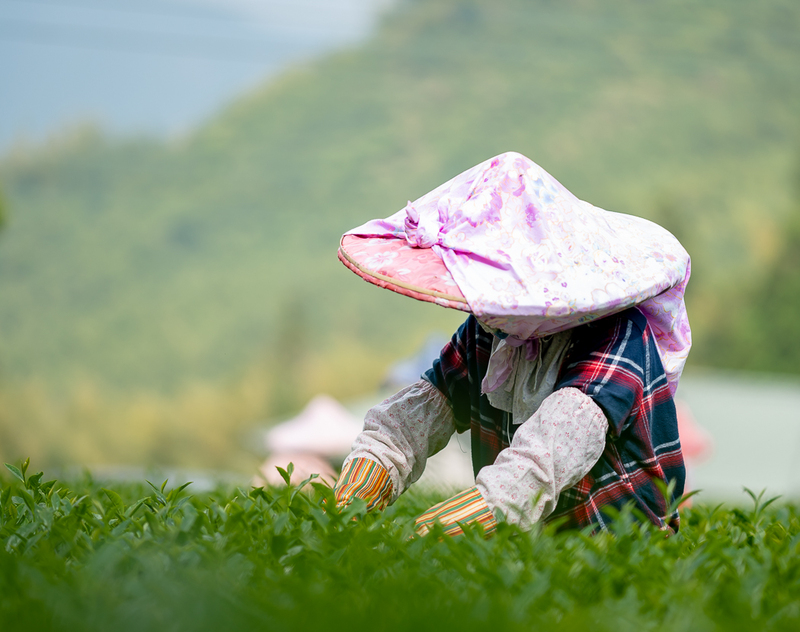 Producing the perfect leaf takes skill and luck with the weather. 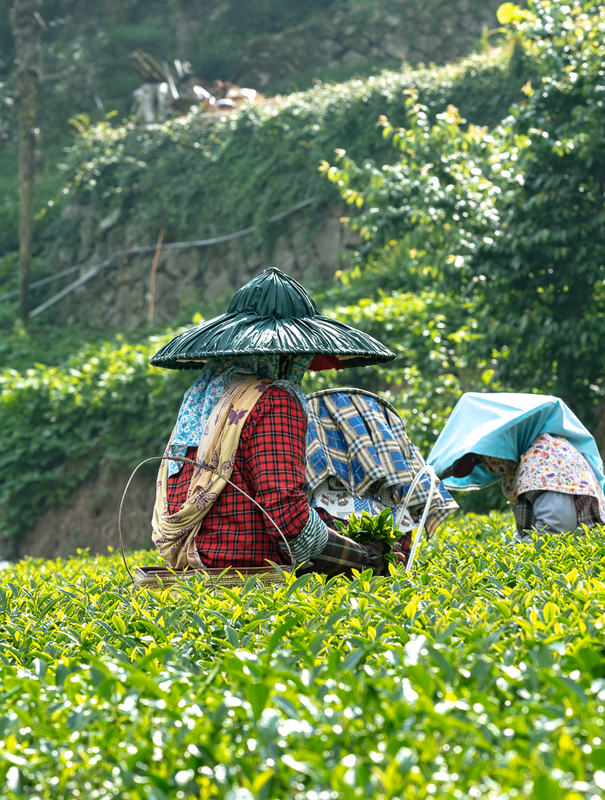 Finding such tea means you can't rely on one farmer alone. Because even if he's skilled, he might be unlucky! The hail damage in this plantation explains why I wasn't satisfied with what I was tasting. That's when you have to be persistent and insist on top quality. It's like with photography: it's at the end of this long day, that the light became the best and allowed me to take this wonderful picture. So, after repeated tastings I decided to visit an other farmer I know in the region. 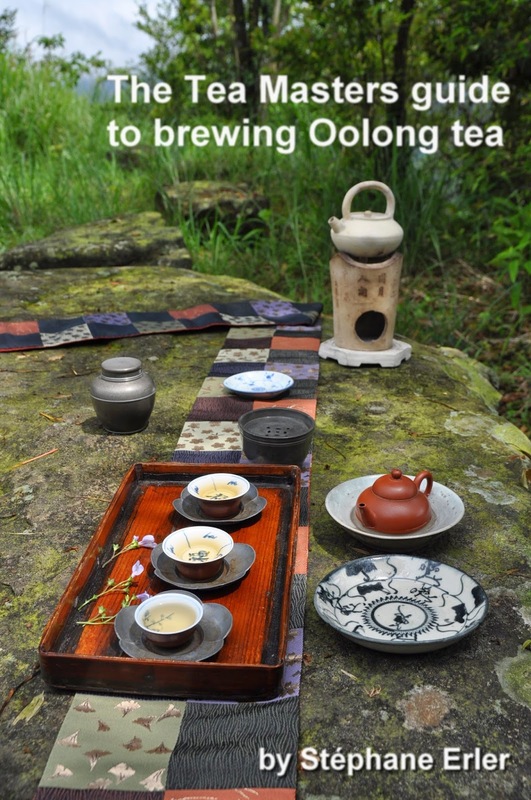 There, I found exactly the wonderfully fragrant and smooth Alishan Oolong I had been searching! 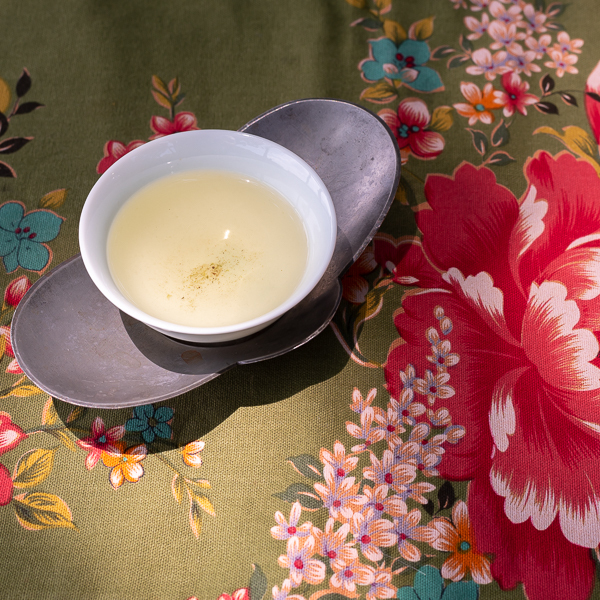 This kind of delicious buttery and floral flavor is quite unusual this spring. 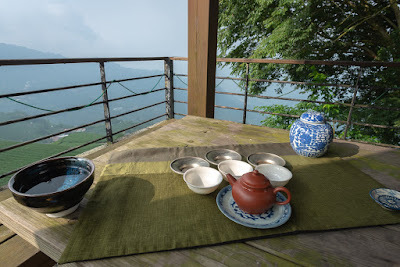 Now I could take a well deserved rest and enjoy my high mountain Alishan Oolong on a spot overlooking the tea plantations of ChangShuHu! My Green green green Chabu fits wonderfully on this wooden table where some moss starts to grow! The golden brew lights up when a ray of sun escapes the clouds. This high mountain Oolong echoes the sweetness of sunshine. 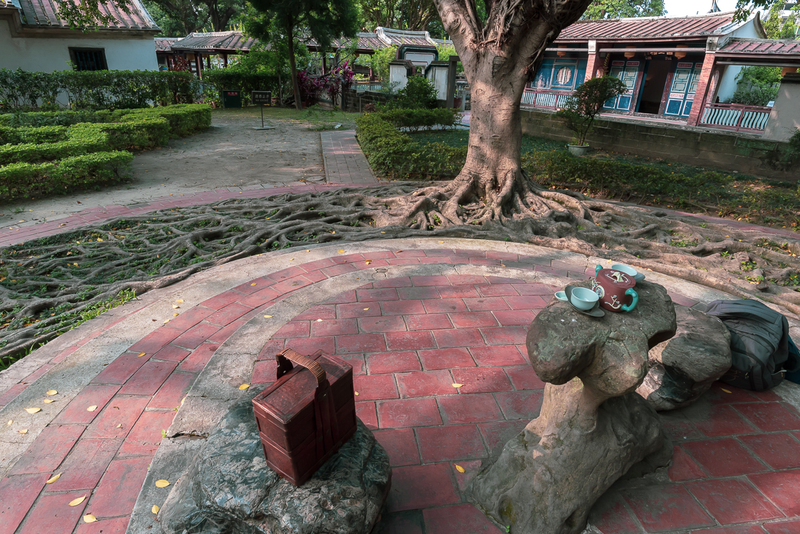 It's a double happiness to drink tea so close to where it's growing! 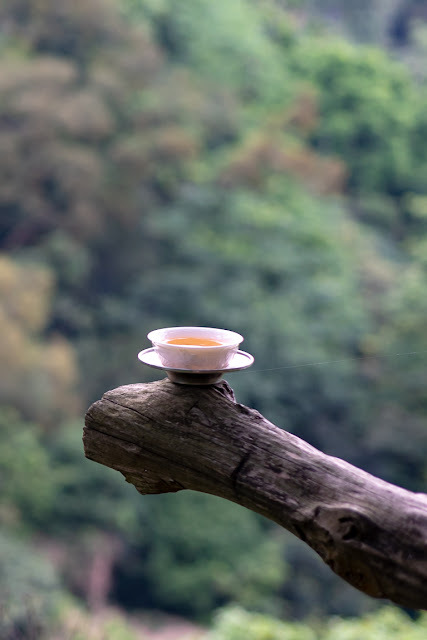 The tea exudes the very same scents that are floating in the air all around me! Tea leaves are so sensitive to their environment and to the weather... 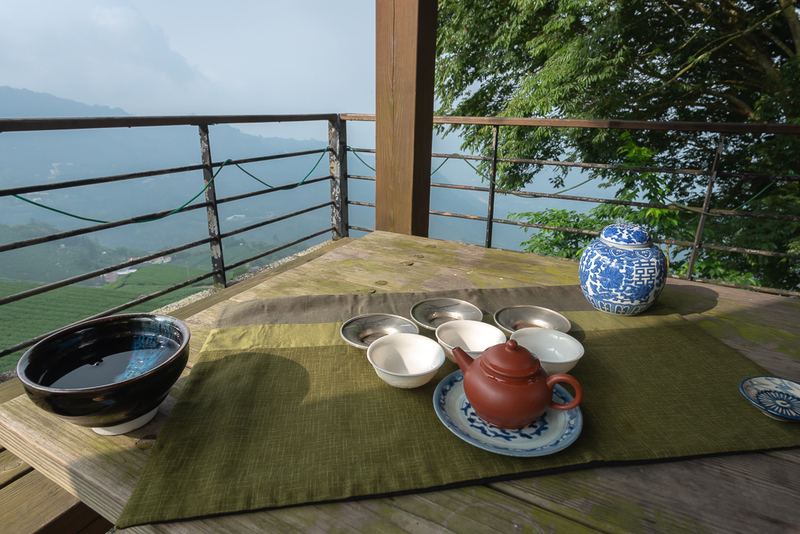 The fresh energy of Alishan resonates in each cup! 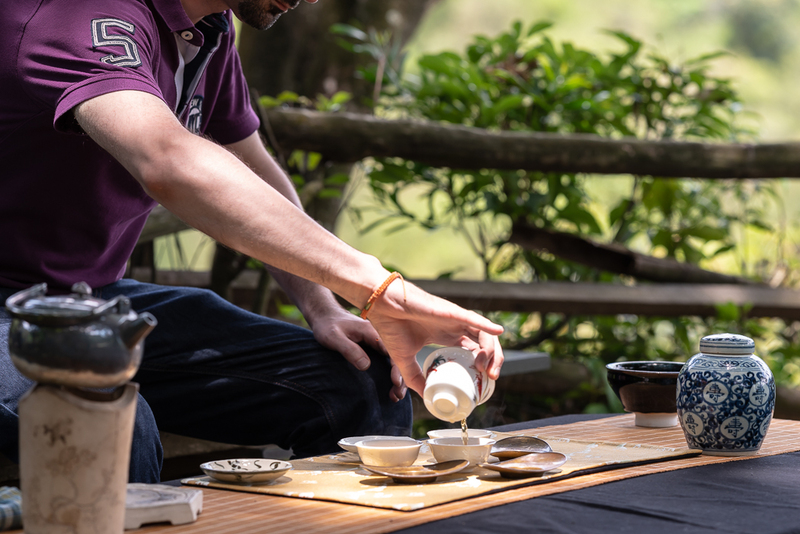 The afternoon ends with this stunning Alishan Oolong: it's a glorious finish for long day of exploration, tastings and photography! 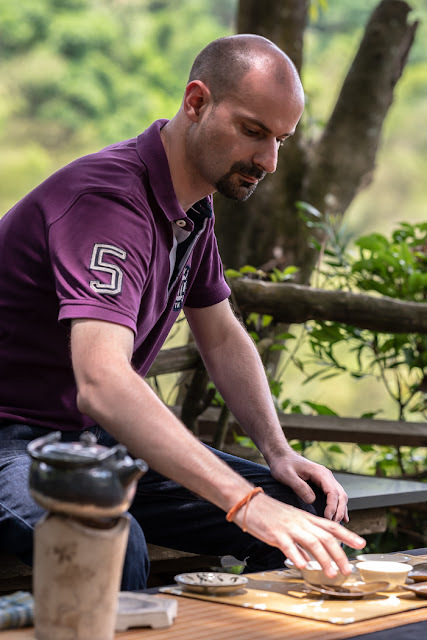 A foggy night is about to set in Alishan, but I'm seeing stars and far away galaxies in my Chaxi! 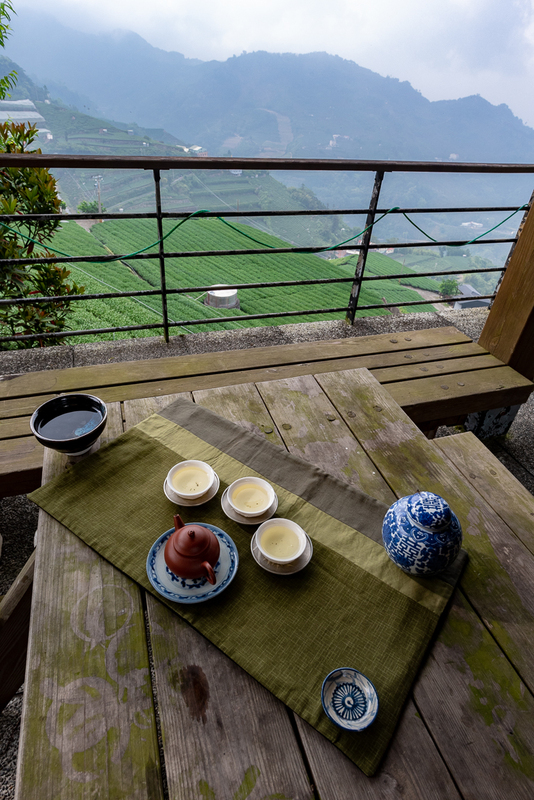 J'ai passé plusieurs jours à chercher du bon thé dans les montagnes du centre de Taiwan cette semaine. 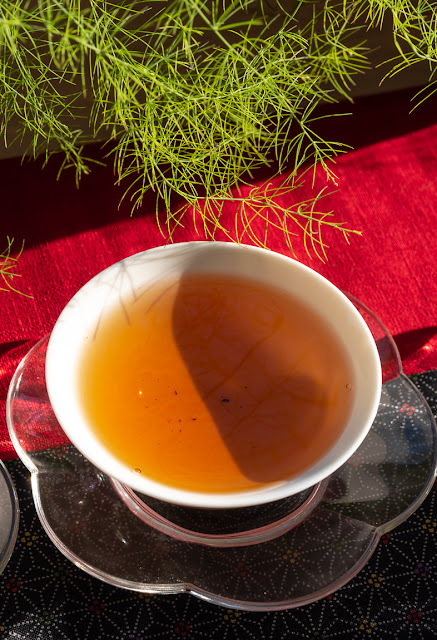 Plus de photos et d'article suivront et les nouveaux Oolongs apparaitront bientôt sur mon site (note: c'est fait!). Mais avant de parler des challenges rencontrés cette semaine, je veux vous parler de ma préparation en vue de mes sélections. 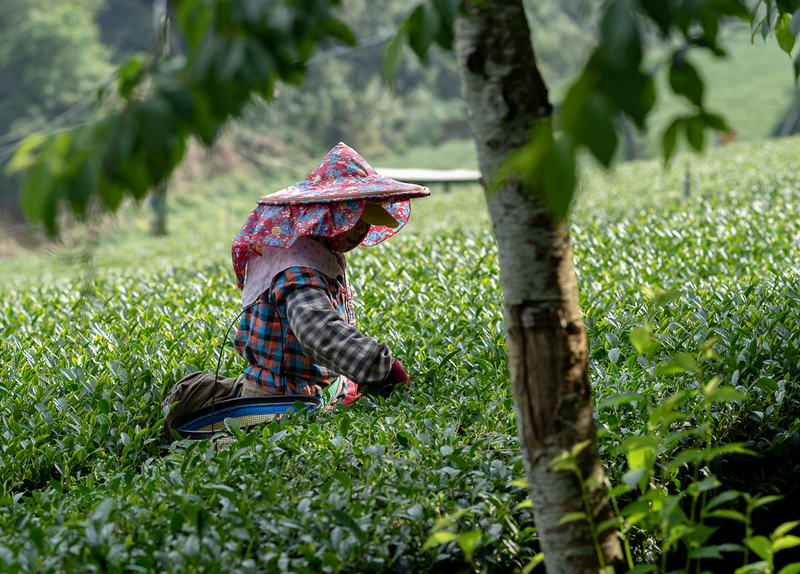 Trouver du thé chez les fermiers, c'est comme passer un examen à l'école! Il faut réviser ses classiques, les arômes des différents cultivars, les particularités de chaque terroir... C'est l'expérience du bon qui permet de trouver meilleur, car si on est habitué au médiocre, on se satisfaira trop rapidement par des feuilles de qualité moyenne. C'est pour cela que j'ai souvent bu de mes meilleurs Oolongs de haute montagne (comme ce Da Yu Ling) récemment. Il s'agit d'habituer mes papilles à ce qui se fait de mieux, afin qu'elles deviennent très sensibles et exigeantes. Il est aussi important d'avoir de bons contacts parmi les producteurs et c'est vrai que leur rendre visite permet d'approfondir ces liens. 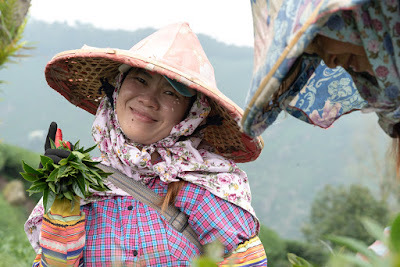 Il est facile d'éprouver de la sympathie pour eux quand on voit toute l'abnégation qu'ils mettent dans la production du thé. Ce sont des journées de 14 heures de travail (minimum) pendant plusieurs semaines d'affilé! Mais il faut quand même savoir garder une certaine distance pour rester objectif. C'est la qualité du thé qui doit primer! Ainsi, cette semaine, je n'ai pas acheté mon Oolong chez le fermier avec lequel j'ai passé le plus de temps. Pourtant, c'est un gars extraordinaire, souriant, très consciencieux et traditionaliste dans ses méthodes de production. J'apprends beaucoup avec lui et j'essaie aussi de lui rendre la pareille autant que possible. Il a des plantations très bien situées et elles ont un super potentiel comme j'ai déjà pu le contaster. Mais cette année, pour des raisons que je montrerai une autre fois, son Oolong ne fut pas à la hauteur de mes attentes. 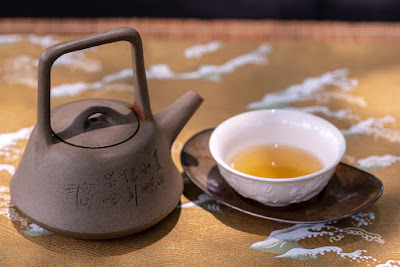 Et c'est chez un de ses voisins, en 20 minutes, que je trouvai un Oolong avec un super rapport qualité/prix! J'étais désolé de cette injustice, mais je me dis que j'ai fait de mon mieux en lui donnant la priorité de mes dégustations. 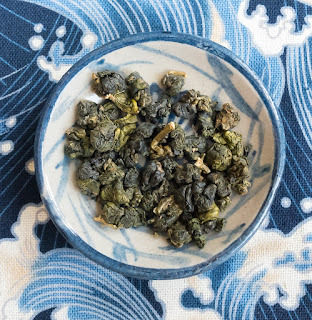 En conclusion, pour trouver du bon Oolong, il faut avoir une bonne idée de ce qu'on cherche! Il ne faut pas se laisser guider par ses sympathies, mais par ses papilles bien éduquées!